Aberdeen South MP Ross Thomson. 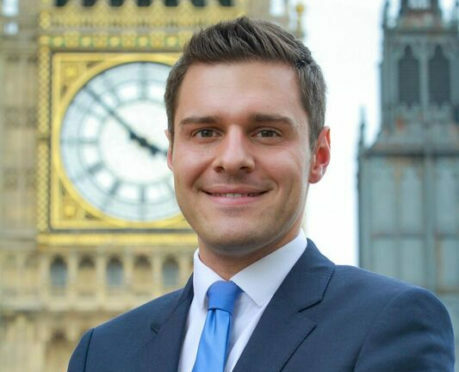 Tory MP Ross Thomson has referred himself to a disciplinary panel but wholly denied allegations he was escorted from a Westminster bar by police following complaints of “sexual touching”. Officers from the Metropolitan Police swooped on Strangers Bar on the parliamentary estate at around 11pm on Tuesday after an incident involving three men in their 20s and 30s. Mr Thomson, MP for Aberdeen South, had remained silent until yesterday when he took to social media to dismiss reports that he was one of the men involved. In his statement, he said: “A series of serious allegations have been made against me that have featured in the media. “I would like to state that these allegations from anonymous sources are completely false. No complaint has been made to the police, Parliament or the Conservative Party. “Nevertheless in the interests of openness and transparency, I am referring myself to the Conservative Party’s disciplinary panel of the code of conduct. A police spokesman confirmed on Thursday that no formal complaint had been made about the incident and that there had been no arrests. Mr Thomson is expected to sit down with a party official in the next week who will decide whether there is a case to answer. If it is concluded that further investigation is required, the matter will be referred to an independent panel chaired by a QC. A party source told the Press and Journal that the issue should be resolved “in a matter of weeks”. Questioned about the claims, which came to light after police attended the bar late on Tuesday, Mr Carlaw said he became aware of the reports from social media the day after. After the reports emerged, the Tories referred the matter to the Westminster whips office. If it is concluded that further investigation is required the matter will be referred to an independent panel chaired by a QC.